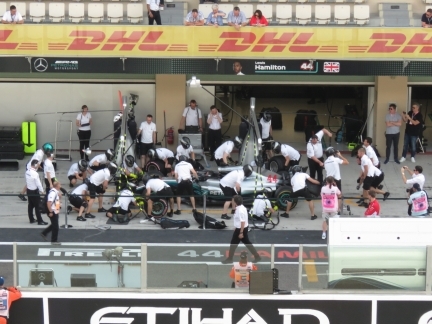 Two supporting races, both with standing starts, were held on Saturday, our third day at the Abu Dhabi Grand Prix. 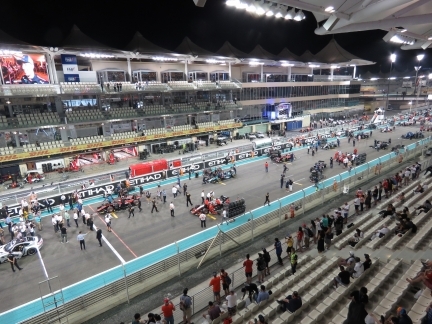 The GP3 series race took place in the afternoon and the Formula 2 race in the evening, giving us a taste of the Formula 1 race that would take place at dusk on Sunday. The telmetry from ART Grand Prix car number 4, viewed in the support paddock Saturday morning before the first GP3 race. The primary race mechanic tool has now become the laptop computer. Here you can see the engine is in race mode and idling at 2916 RPM. 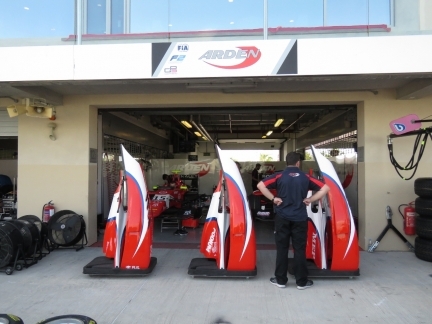 Engine cowlings removed from the Arden GP3 cars for service access. It’s Saturday morning, about half an hour before the first GP3 race. 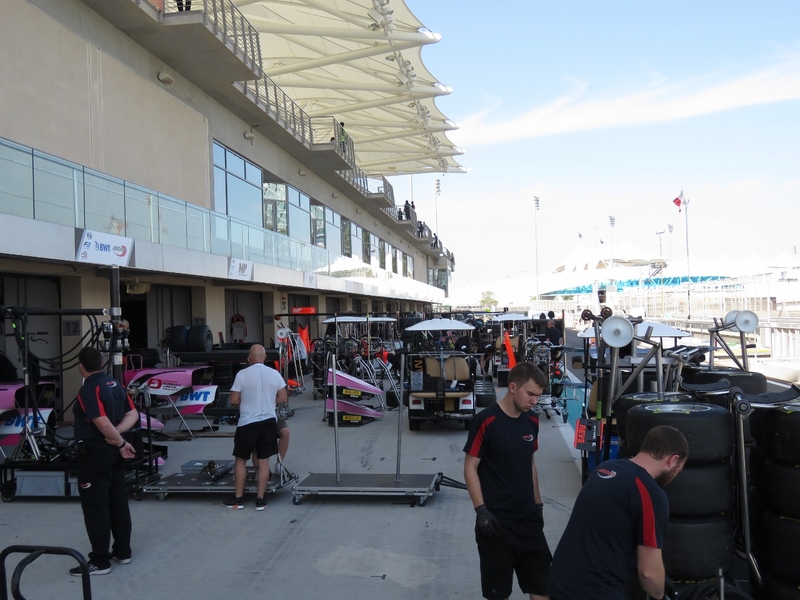 The teams are focused and each is loading up a multi-trailer train of parts, tires and tools to tow to the main Formula 1 pit area that the GP3 cars will be using during the race. We had a great opportunity Saturday morning to meet with McLaren Racing Director of Strategy Randeep Singh (left) and Nick Martin, Director of Partnership Development. 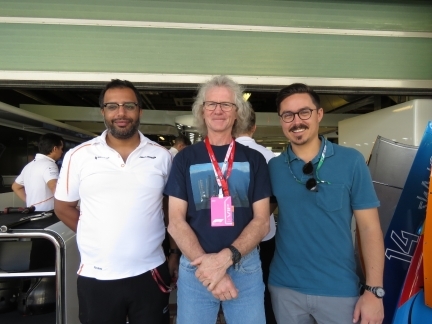 Here Randeep, James, and Nick are standing in front of Fernando Alonso’s paddock. 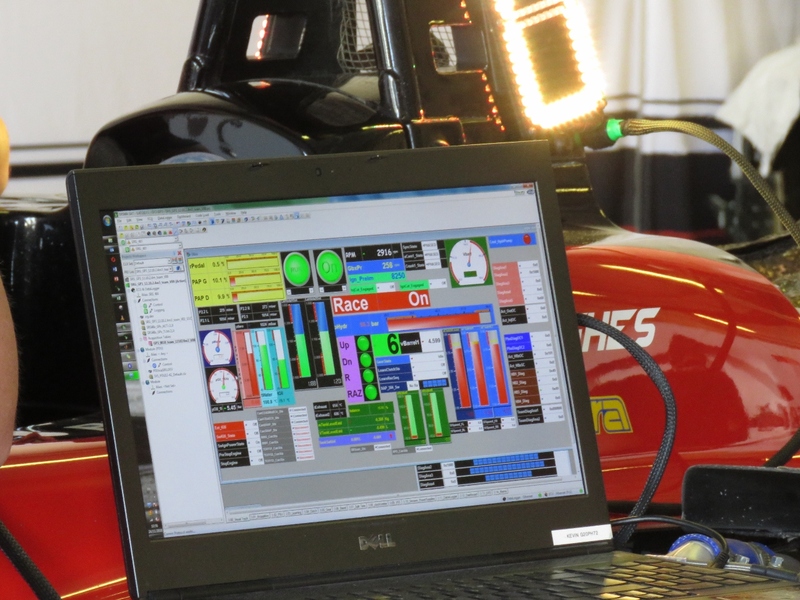 McLaren Racing is impressively deeply invested in data analytics, machine learning and simulation. Prior to a race, they simulate different strategic situations that might arise and model the best response. 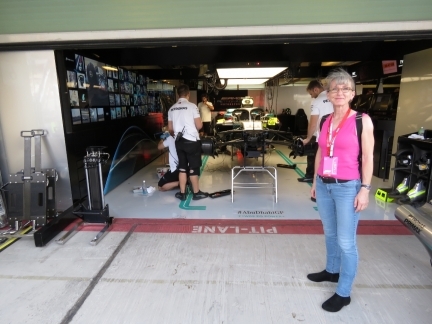 During the race, Randeep will be sitting on the left side of the McLaren pit wall and will be communicating in real-time to a team of more than sixty people at McLaren Racing headquarters in Woking, England. Their job is to make the right call within seconds of something big changing in the race, such as Mercedes pitting early. The GP3 cars lined up in starting order prior to the formation lap for the first GP3 race of the 2018 Abu Dhabi Grand Prix weekend. One of the most exciting parts of the weekend’s Formula 1, Formula 2 and GP3 races is the standing start. After the formation lap, all cars roll up to their respective starting positions and when the last car is in place and the safety car arrives at the back of the grid, the starting lights begin. First one light comes on, then a second later two, and eventually all the lights are on and all cars on the grid are sitting at full RPM with the drivers ready to launch, staring at the row of lights. When the lights go out, they all launch. 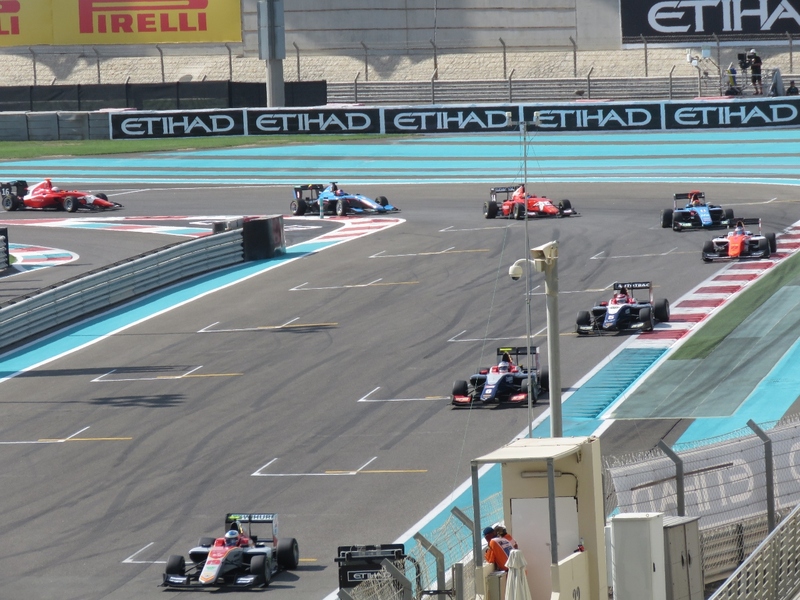 The GP3 cars exiting corner 21 towards the start-finish line about to complete the first lap of the race. It was an exciting event with several lead changes between pole-sitter and title-contender Nikita Mazepin and second place qualifier Leonardo Pulcini. 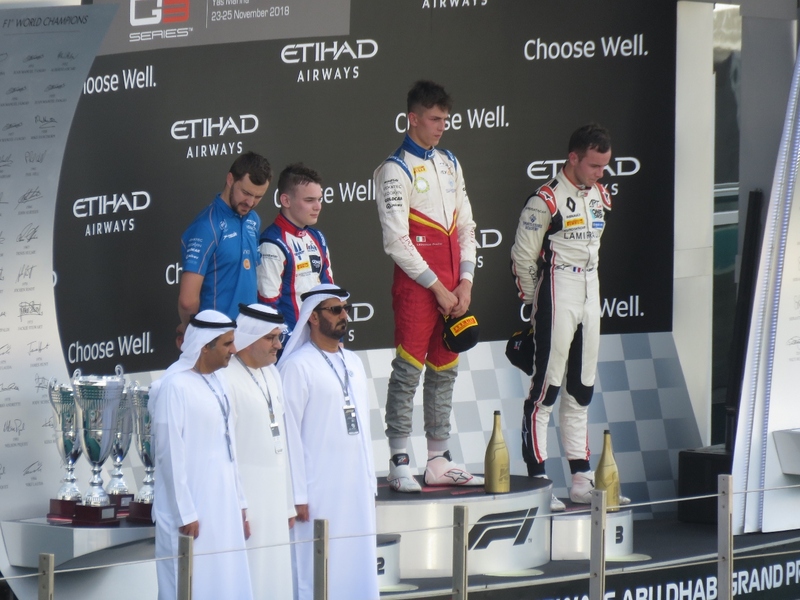 Leonardo Pulcini (first), David Beckmann (second), and Anthoine Hubert (third) on the podium following the first GP3 race. 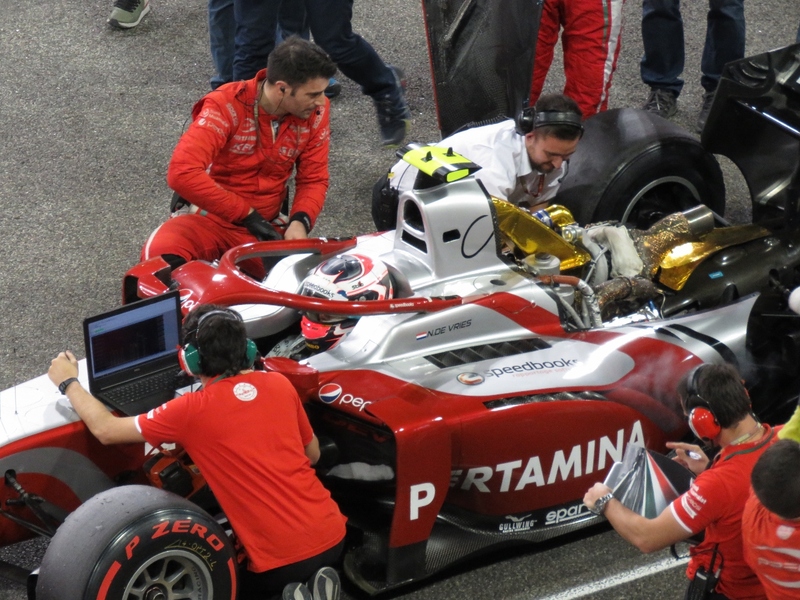 Hubert lost second place to Beckmann on the final lap, but took the GP3 title with his third place finish. 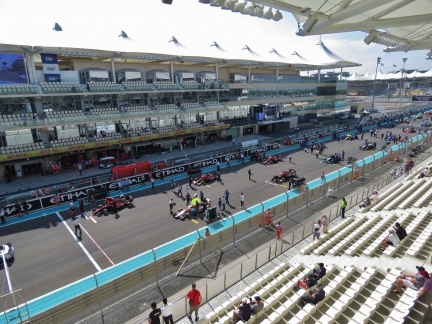 Because the Formula 2 and GP3 cars use a paddock that is quite a long way from the pit area on the front straight, three cars are set out to tow back the first, second and third place cars after the podium celebration. A swarm of people around Lewis Hamilton’s number 44 as the Mercedes-AMG Petronas team readies the car for the upcoming practice session. 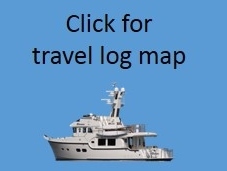 This is a busy time for the team. This afternooon the three qualifiying sessions will be held to set the grid order for the race tomorrow. The 2018 F1 safety car: a 585HP Mercedes-Benz AMG GT R. These cars handle well, stop even better and aren’t quite up to Formula 1 acceleration, but are still impressive. 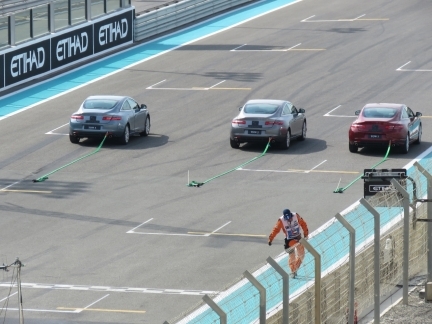 And the safety car drivers are excellent. Jennifer in front of the Mercedes-AMG Petronas garage 45 minutes before qualifying. It’s close to game time and the work is mostly done, with the teams finishing the remaining preparation for qualification at a relaxed pass. 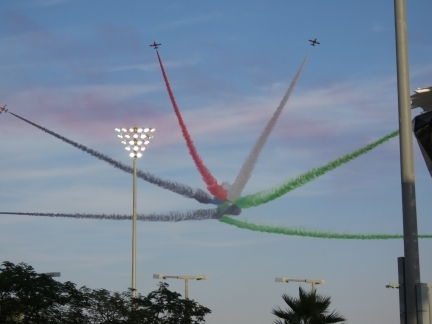 The UAE Air Force acrobatic stunt team, Al Fursan (‘The Knights’), performing an air show. The team flies Italian Aermacchi MB-339s fighter jets with a maximum speed of 557mph (898 km/h). There are seven planes, one for each state in the UAE. 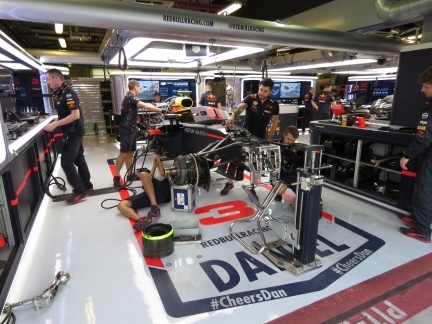 The Red Bull team preparing Daniel Ricciardo’s car for the upcoming qualifying session. 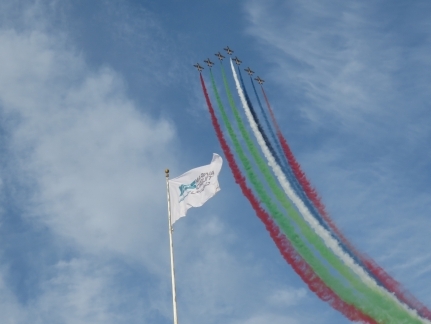 Another display by the UAE Air Force acrobatic stunt team, Al Fursan. Green, black, white and red are the colors of the UAE flag. Kimi Raikkonen’s number 7 Ferrari coming into the pit during qualifying. 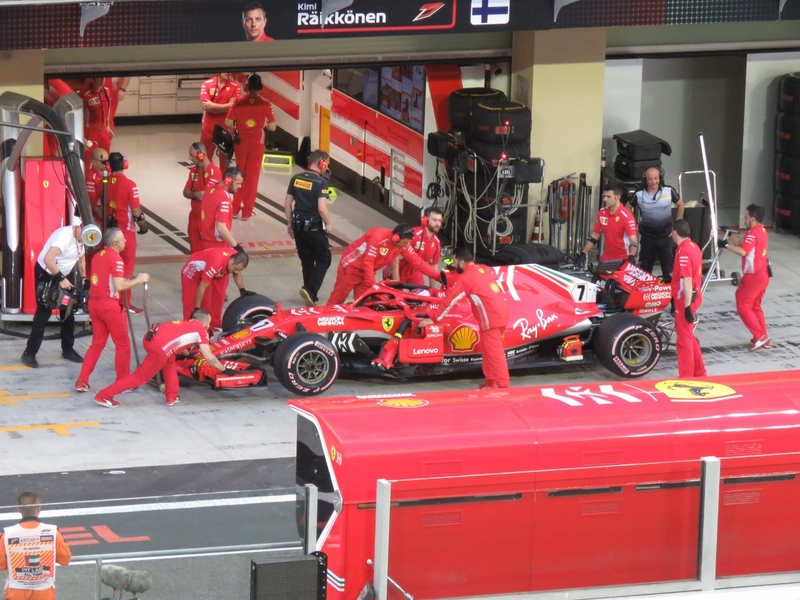 Because the tires used for qualifying have relatively limited optimum tire life, the teams are careful to send the car out at exactly the right moment to get a good-sized gap in front of them. And they bring them in frequently to make adjustments or change tires. Because the teams are limited in the number of tires they’re allowed to use over the course of a weekend, they only spend the time on the track that they need. Sunset at 5:10pm, ten minutes into the F1 qualifying session. 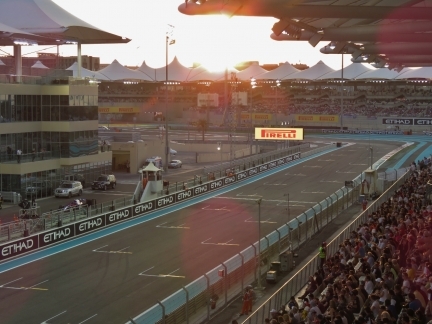 The stands are quite full compared to the GP3 race earlier today. Perhaps the best viewing position in the Paddock Club, opposite the track from our seats, where the balcony stretches out towards the track with a clear view past the start-finish line. What looks like the track stretching behind is actually an image on a massive TV screen behind. 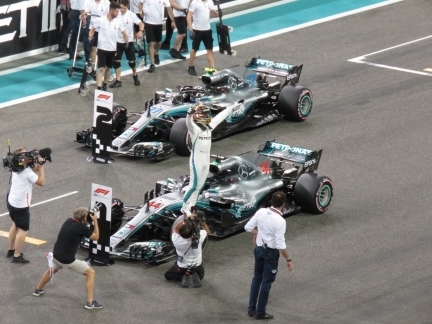 Lewis Hamilton celebrates taking the pole at Ahu Dhabi for the final race of the 2018 Formula 1 season. Cars lined up on the starting grid ten minutes before the start of the first Formula 2 race of the weekend. Each car is surrounded by its crew with a trailer-load of tires and tools in case something goes wrong. 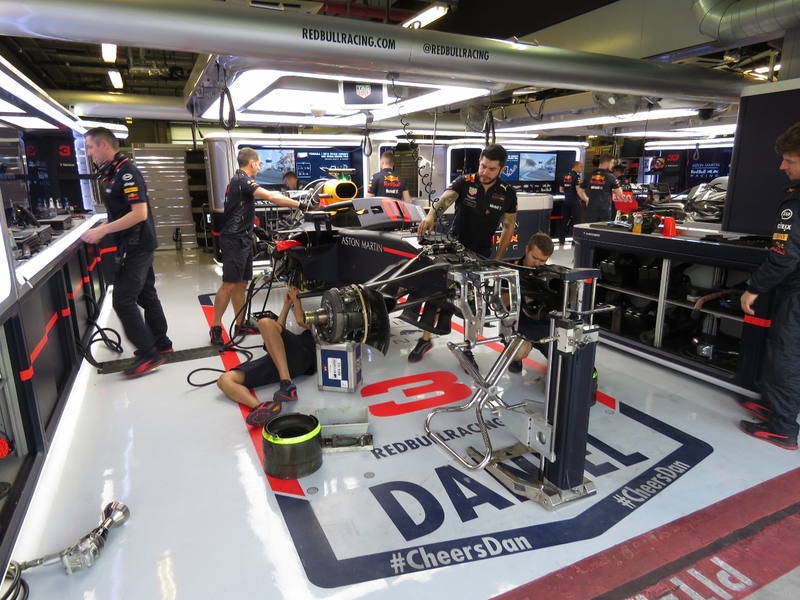 Most crews and drivers are tensely waiting for the start, but a few are busy with a last-minute problem. It’s now four minutes before the start of the race and the Pertamina Prema Theodore Racing has the engine cowling off Nyck de Vries car number 4 and a laptop plugged in, working under a tight deadline. The standing start is super-exciting and the only downside is if one of the cars near the front doesn’t start, there isn’t much time to avoid it. 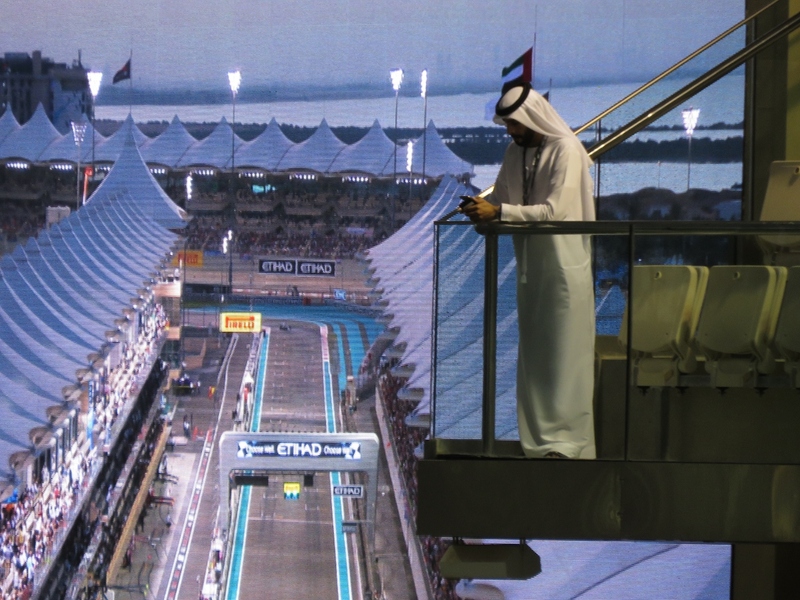 It’s not that common for a car to stall, but in the first Formula 2 race at the 2018 Abu Dhabi Grand Prix weekend, when the lights went out, three cars didn’t move. One of the cars, Alexander Albon’s, was near the front of the pack, where the closing speed from cars that were near the back of the grid will be 120-150 mph (195-240 km/h). 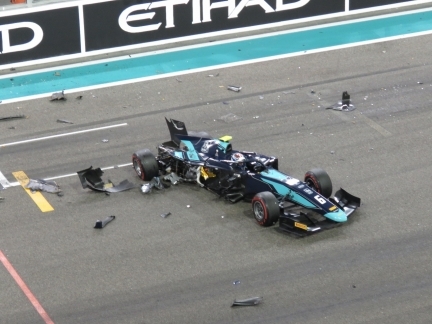 Car after car just barely dodged Albon in the last second, but Nicholas Latifi didn’t make it and the two cars exploded into a cloud of carbon fiber. Albon’s car was tossed a couple of car lengths forward and Latifi’s car came to rest about a few hundred feet down the track. 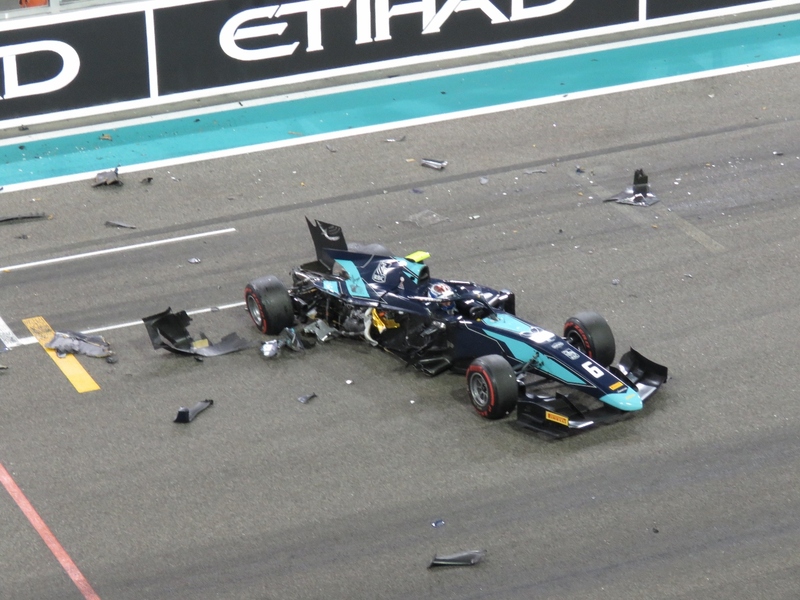 Fortunately both drivers were unhurt and Albon even managed to re-enter the race and finish 14th. 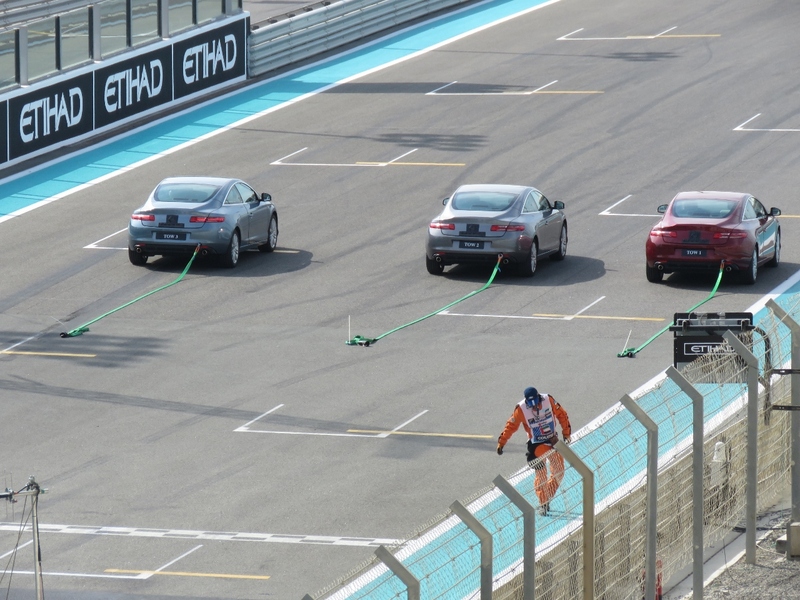 When all cars get off the line in a standing start, they’re all accelerating at around the same speed, so the rate of acceleration doesn’t look that extraordinary. But when there’s a stationary car on the track, the massive acceleration is more obvious. Here’a a 48-second video from the lights going out, through all the close calls, through the massive contact between Albon and Latifi: https://youtu.be/n729XkhEEfc.